The Early Years programme at SISD has been carefully designed to encourage inquiry-based learning for children from age 3-5. We follow the programme of the IB Primary Years Programme (IB PYP). Students are fortunate to learn in a multilingual and multicultural environment that provides a wide range of opportunities academically, culturally, socially and physically. Admission to the Early Years bilingual stream is no guarantee for continuation of bilingual in Primary. At any point during a student’s SISD school career a change to E+ will be discussed if progress reports, language support provisions and teacher feedback recommend this transition to the student’s academic benefit. Learn more about Early Years at SISD here. Bilingualism is defined as the regular use of two or more different languages. We are committed to early immersion, which research has shown to be the most suitable tool that allows children to have command of more than one language at a highly functional level. The aim of immersion at SISD is the development of two or more languages, as well as the appropriate knowledge of the subject content and intercultural competence. The language input is age-appropriate, comprehensible, and both lexically and structurally rich. Language contact is action and content-oriented. In Pre-Kindergarten, the main teacher is a native French or German speaker with an English speaking teaching assistant. In KG1, English is the main language of instruction and children are exposed to French through teaching assistants. Children also attend one daily lesson of French taught by a qualified language teacher. In KG2, children are taught by a native English-speaking teacher and a native French speaking teacher, instructing both languages on a daily basis. Arabic lessons are taught on a weekly basis. In KG1, English is the main language of instruction and children are exposed to German through teaching assistants. Children also attend one daily lesson of German taught by a qualified language teacher. In KG2, children are taught by a native English-speaking teacher and a native German speaking teacher, instructing both languages on a daily basis. Arabic lessons are taught on a weekly basis. The English+ stream starts from Grade 1 onwards. From Pre-KG to KG2 all students are taught in the bilingual programmes. The Primary School at SISD encompasses Grades 1-5, ages 6-11. Students in the Primary School follow the IB Primary Years Programme (PYP), a curriculum framework that is learner-centred, inquiry driven, concept-based and transdisciplinary. At any point during a student’s SISD school career a change to E+ will be discussed if progress reports, language support provisions and teacher feedback recommend this transition to the student’s academic benefit. Learn more about the SISD Primary School here. At SISD, we currently offer two fully immersive bilingual streams: English/French and English/German. We define bilingualism as the regular use of two or more different languages in daily life. Therefore, a bilingual person is able to communicate, think and reflect in (at least) two different languages, even if one of the languages remains dominant. Bilingualism is designed to offer learners the chance to develop international-mindedness, to broaden their skills and capabilities and to acquire the information needed to access other cultures. In the bilingual programmes, one week is taught in English and one week in French or German. This cycle is repeated yet the curriculum is continued throughout the academic year. Our English+ programme offers the choice of studying either French or German as an additional language. All subjects are taught in English and learners attend daily additional language lessons. During these lessons, the qualified additional language teacher communicates systematically in the target language, using an inquiry-driven approach while following a specific language acquisition curriculum. Learners build the communicative language skills and competencies they will use as global citizens. The school’s unique international and multilingual environment provides students with authentic exposure to French and German through the daily contact with native speakers. The International Baccalaureate Middle Years Programme is a holistic programme in that it requires students to develop depth of knowledge across a broad curriculum. The MYP is organised around three main principles: multilingualism, intercultural understanding and holistic learning. The curriculum is organised around building conceptual understanding in a discipline-based model with interdisciplinary units in each year. Students develop academic skills organised into ten skill clusters known as the Approaches to Learning (ATL). 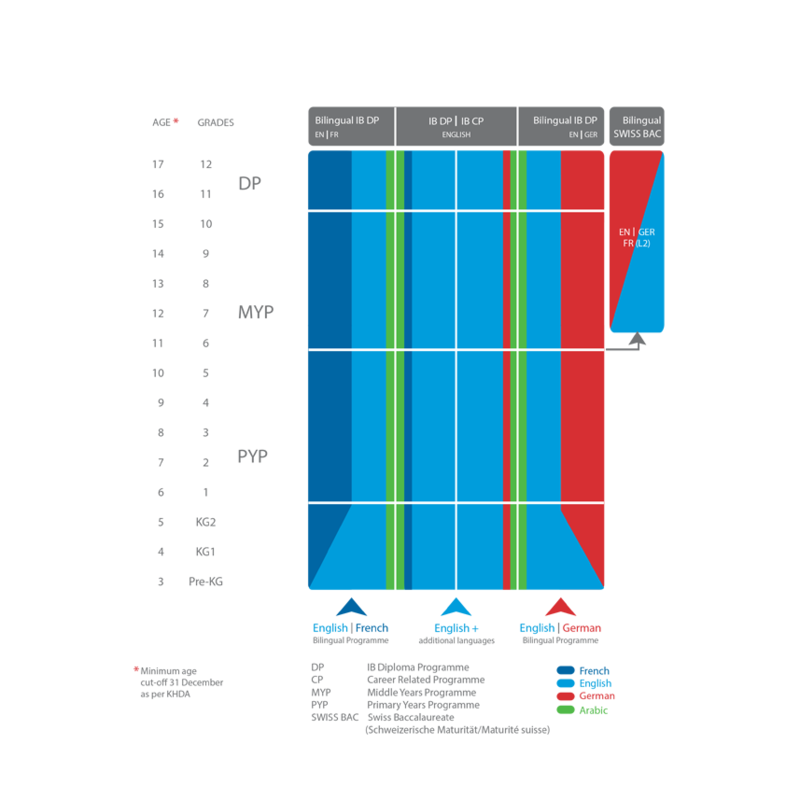 The MYP culminates in the new MYP eAssessment suite of onscreen exams and eportfolios for the award of the IB MYP Certificate. Interdisciplinary Learning is focused on developing interdisciplinary and critical-thinking skills. The interdisciplinary units involve two or more disciplines working together to explore a topic with more breadth. There is a strong focus on the transfer of knowledge and skills across disciplines to develop deeper conceptual understanding. The Community and Personal Projects involve students working collaboratively (Community Project) and independently (Personal Project) on a topic or community need of their own choosing and under supervision completing an investigation related to their own areas of interest and particular talents. Service as Action (SAA) in the MYP is built on a similar model to and introduces the Diploma Programme CAS component. The focus of SAA is to provide authentic, real life extensions to the academic programme which benefit communities and provide in many cases an experiential learning element. While it is not formally assessed, it is monitored qualitatively and completion is a requirement for every year of the programme. Each examined subject is graded on a scale of 1 (minimum) to 7 (maximum) as a final grade. This grade is determined by how students perform against four assessment criteria in each subject. Through a programme of continuous assessment, students demonstrate progress against the assessment criteria throughout the year and final achievement levels determine the final IB grade. On completion of the fifth year of the programme, students take final onscreen exams and – if successful – are awarded the IB MYP Certificate. Students in the English+ programme attend four weekly lessons of French or German as an additional language. As they learn to communicate perfectly in English, they also move towards fluency in French or German with intensive Arabic lessons. Our bilingual programmes extend through to the Middle Years Programme, where students study certain disciplines in French or German and others in English. The bilingual students who take subjects in French or German as well as English are eligible for the award of the bilingual MYP Certificate on completion of the programme. The two year International Baccalaureate Diploma Programme allows students to develop an excellent breadth and depth of knowledge. The Diploma (DP) is a truly international programme, developed in consultation and collaboration with educators from around the world. DP students are prepared for active participation in a rapidly evolving and increasingly global society as they develop intellectually, emotionally, physically and ethically, while acquiring the skills that will prepare them for further education and life in the 21st century. Learn more about taught subjects here. Theory of Knowledge (TOK) is focused on developing interdisciplinary and critical-thinking skills. TOK explores interdisciplinary themes across subjects and encourages critical reflection and analysis. Extended Essay requires students to select, research, and write an in-depth, independent submission of 4000 words, usually in one of their six subject areas. The Extended Essay requirement offers IB Diploma candidates the opportunity to become familiar with the independent research and writing skills expected at university. Creativity, Action, Service (CAS) work(not bold) CAS is a fundamental part of the Diploma experience, helping students to grasp the importance of extracurricular activities as an integral part of life, and as a healthy counterbalance to the world of pure scholarship and study. These initiatives and activities are a key part of our students’ education, and include local and global community outreach projects, charity drives, Model United Nations, sports and many more. Each examined subject is graded on a scale of 1 (minimum) to 7 (maximum). The award of the IB Diploma requires a minimum total score of 24, based on the principle that a grade 4 represents a passing level in each of the six subjects. Excellent performance in the six subjects results in a grade 7 for each, or a total score of 42 points. Students can earn an additional 3 points for superior work on the Extended Essay and in Theory of Knowledge. Our bilingual programmes extend through to the Diploma Programme, where all students study English Language and Literature. In addition to this, we encourage those who have the relevant experience to study Language and Literature in French, German or Arabic, which results in the award of a bilingual diploma. For those who are not yet bilingual, our English+ programme will ensure that all students achieve a degree of bilingualism depending on the level at which they study. In Grades 6-9 students are to attend preparatory classes. These four years in our so-called hybrid classes (German-English bilingual, IB combined with Swiss Baccalaureate Curriculum) lay the foundation for a successful Swiss Baccalaureate education. Upon completion of this four-year phase, a student can be admitted to the Swiss Baccalaureate section or can switch to our MYP/DP programme. 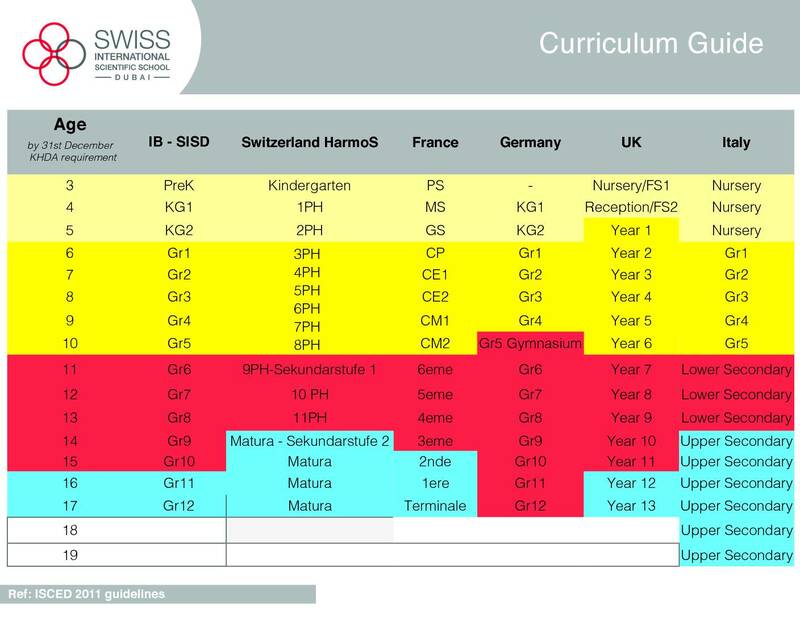 The final decision to join the Swiss Baccalaureate section is taken in Grade 9. The curriculum then covers ten basic subjects, one core subject (a specialist subject) and one supplementary subject (Grade 10-12). At SISD we prepare students for the bilingual Swiss Baccalaureate. Beside English Language Arts, three subjects are examined in English: Geography, History and the chosen Supplementary Subject. For learning objectives and assessment click here. For more information on the Swiss Baccalaureate click here.